Hi! I've finally started feeling Christmassy (although my decorations are not up yet...it's still too early for that!) 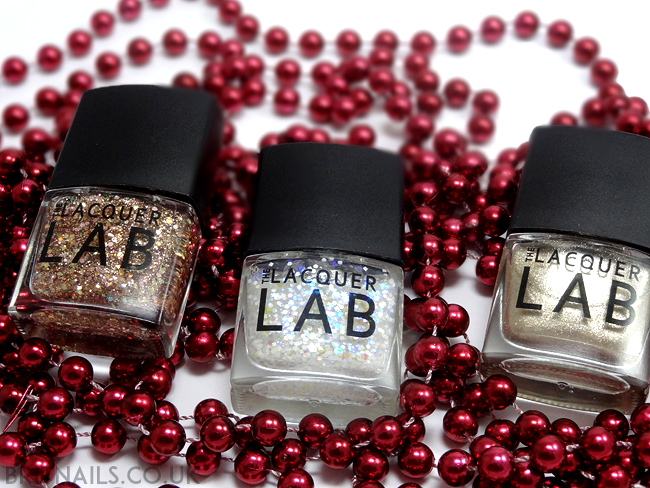 and today I've got the limited edition festive trio from The Lacquer Lab to show you, so cosy up and read on! I always love it when brands release limited edition polishes for the festive season (and, let's face it, any other season) they really get you in a Christmas mood! 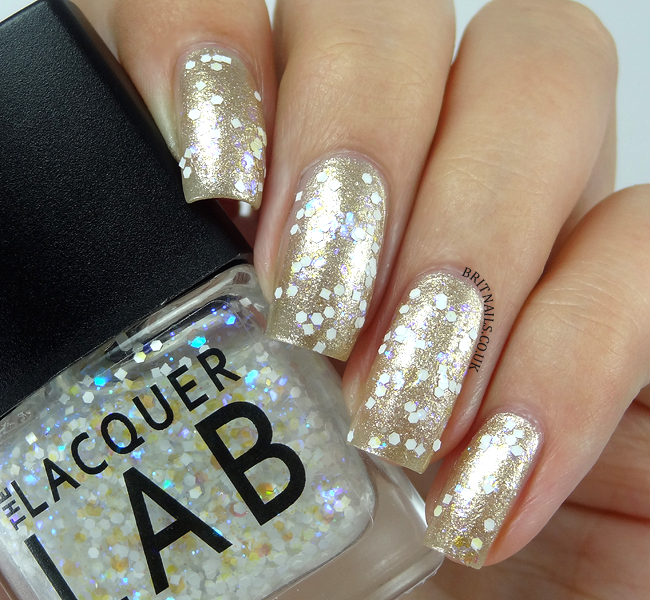 The Lacquer Lab have done good with this cute set, including a gold shimmer and two party-ready glitters. I Want a Pony (possibly the best name for a polish I've seen this year!) is a champagne-gold, foil-like shimmer. The formula is wonderful and applies smoothly. I'm wearing 3 coats plus top coat. Fred & Ginger is a glitter topper full of gold and rose gold glitters; there's a good amount of glitter in here and it spreads out nicely over the nail. This looks stunning over I Want a Pony, it creates an almost crinkled effect! I'm wearing 2 coats over I Want a Pony, plus top coat. Snowglobe is also a glitter topper, containing matte white glitters and electric blue flecks which look like little flashes of light. 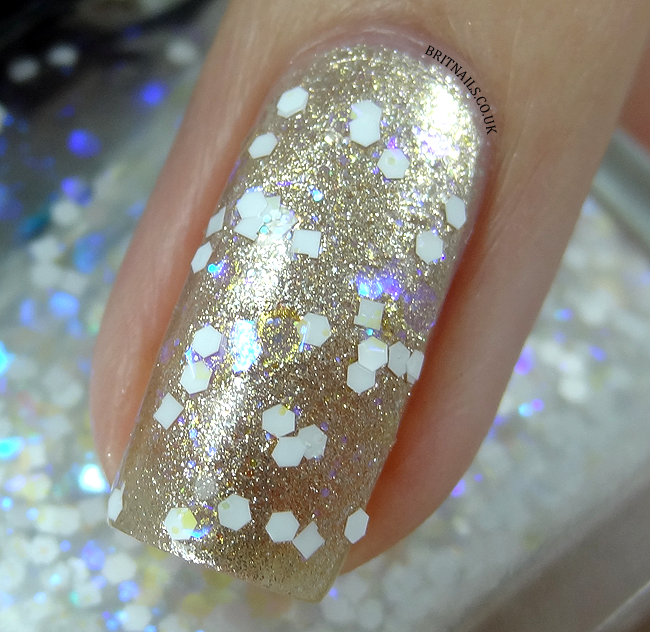 The glitter in here is a bit more sparse than in Fred & Ginger, but it works well for the snowglobe effect! This is 2 coats over I Want a Pony, plus top coat. This is a perfect mini set of polishes for the festive season, and don't forget they're limited edition so grab while you can! - Available only from thelacquerlab.com, priced £9 each or £24 for the set. There's still some available but they're selling fast! OOhhh these are cute and super festive!